Video Poker Strategy, Games Terms completes VP gamerisms. This part of the glossary includes these distinctive terms: Penalty Card, Quad, Rainbow, Trips and X. Part 3 concludes with Newer Video Poker Games Reviews. Pat Hand: winning hand is dealt with five initial cards. Whoopee, collect those credits. Payback Percentages: % of how much a game will give back to the player in the long run given expert strategy. 9/6 Jacks+=99.5% game means that if you make expert plays, the most likely result is that you will get back $995 of every $1,000 you wager. Payout: number of coins or credits paid for a winning hand expressed as ‘one-coin’ payout. Multiply by 5 for total payout for max coin play. Example=Jacks+ full house=9 for 1 or 45 coins total. Payout Table: posted at each VP machine. This table displays payouts for each winning hand to correspond with number of coins bet. Example=Jacks+ full house=9 for 1 coin, 18 for 2, 27 for 3, 36 for 4 and 45 for 5 max. coin bet. Pair--Jacks or Better=returns the bet. Royal flush (rf)=pays 250-1--except with max. coins, pays 4000. Penalty Card: term for card received on the initial deal that, if discarded, would decrease the odds of drawing flushes or straights. Example=keep king and queen of diamonds and discard the 2 of diamonds; the 2 is a penalty card because it is a potential piece of a diamond flush that is no longer available to you. Pick ‘em Poker VP: pair of 9’s or better=min. payout. Two cards are displayed along with 2 stacks of 3 cards with 1 card visible=total 4 cards displayed. Choose one stack of three cards to complete a 5-card hand. Positive Expectation: VP game that returns 100%+ for optimum play over the long term. PE is also achieved when combined with cashback and/or comps. Progressive Video Poker: offers growing jackpots dependent upon amount of monies played through the linked VP bank/carousel. When either jackpot wins, values are reset to minimums for each. Max coin play is mandatory here. Rainbow: jargon for several cards of different suits. Random: VP slots draw cards are selected at random from a single deck of 52 cards (53 for Jokers Wild). Each subsequent hand is shuffled utilizing 52 cards and dealt randomly. Rank: in order from top poker hand down is royal flush, straight flush, four of a kind, full house, flush, straight, three of a kind, two pair, one pair or jacks or better. RNG/Random Number Generator: computer program for VP slots which sequences through a series of numbers that corresponds to the results of a single game. Royal Flush: top payout for ace, king, queen, jack and ten of the same suit in any order with no wild cards. Whoopee! Royal Flush Sequential: must be in order from left or right for those VP games offering a separate and much higher jackpot. AKQJT or TJQKA. Royal Flush Wild: formed with wild card(s). Example=Joker royal and/or Deuces royal. Short/Partial Pay Tables: return fewer coins than a full-pay VP for certain hands. Example=8 coins for a full house rather than 9 coins for full-pay machine. Straight (st): sequence of five cards not of the same suit. Example=4-5-6-7-8. 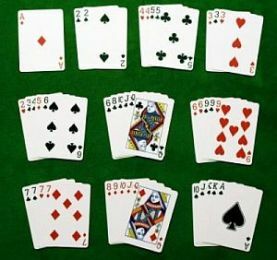 Straight Flush (sf): sequence of 5 cards of the same suit. Example=All clubs 4-5-6-7-8. Strategy: learned technique/methods of playing individual hands determined by the VP paytable and version. Video Poker Strategy Cards: hand-held printed card used to play individual hands of VP games. Recommended as wise video poker strategy. Suit: four suits comprise a non-wild deck of 52 cards: clubs, spades, hearts and diamonds. Super Aces VP/All Aces Online: four aces pays 2000. No kicker required. Super, indeed! Super Double Bonus VP: Quad K, Q & J’s pay 600, Aces=800. Tens or Better VP (10+): pair of tens or better is the minimum payout for this game. Three of a Kind (3/kind): hand with 3 cards of the same denomination. Example=AAA. Trips: jargon for three-of-a-kind. Example=AAA. Two Pairs (2pr): hand with two pairs. Example is AA22. VP Tournament: promotional event where players vie for cash prizes by racking up the highest number of credits for play within a specific time. VP: abbreviation for video poker. Wild Card: used to complete a winning hand. Two popular VP versions are Deuces Wild=4 twos and Jokers Wild=1 wild, but there are other versions with up to 4 Jokers, although.playing 1 Joker Wild is the better video poker strategy. Wild Royal: hand with a wild card(s) to form a royal flush. Example=Deuces or Joker. Winning Hand: any hand where you receive credits. Example=pair of Jacks or three-of-a-kind in Deuces that return your bet. X: symbol that designates a multiplier times payout amount for VP hands. Max. coin return is calculated at 5X single coin bet. Example: Jacks+ full house =9X5=45 coin win. IGT has always been the king of video poker titles and these 4 game reviews prove it. Features: For a 4-of-a-kind or quad hand, there is a buy-a-pay bonus that rewards those wins. With the bonus, 53 cards are presented face down - a standard deck plus one joker. You are prompted to select 1, 2 or 3 cards, depending on the rank of the initiating 4-of-a-kind. A dealt 4-of-a-kind awards one additional pick. You win the total number of credits accumulated through all picks unless the joker is revealed, in which case the total bonus win jumps to 3,996 credits, ending the bonus. Features: This VP version gives the option to wager on up to three additional hands on the draw. Players target desired Mid Play combination by holding appropriate cards to match. A total of up to four possible winning combinations=one additional credit. Wager up to 20 credits on side bet. Features: Buy-a-pay bonus feature: wager one extra credit per hand to qualify. Bonus feature awards higher random jackpot amounts for flush through straight flush categories. Random jackpot amounts change with every hand. This is Part 3 of 3, Video Poker Strategy, Games Terms at gamerisms with a newer video poker games preview.